Twin Eagles Wilderness School publishes a monthly eNewsletter that includes general announcements, special nature connection articles, program updates, exclusive program discounts, and more! To sign up, please use the sign up form on the right. Below you will find a list of eNewsletters and Updates, most current on top. Enjoy! Twin Eagles Wilderness School Update April 2019 - Last Call - Spring Teen Scene - The Incredible Edible Journey! Twin Eagles Wilderness School Update March 2019 - Twin Eagles Spring Alive! Spring Break Camp! Twin Eagles Wilderness School Update February 2019 - Twin Eagles Summer Camps 2019 - The Doors are Open! Twin Eagles Wilderness School Update December 2018 - Winter Break Nature Camp - The Cabin Fever Remedy! Twin Eagles Wilderness School Update October 2018 - Last Chance for Spokane Youth Nature Connection Mentoring! Twin Eagles Wilderness School Update July 2018 - Purpose Summit: Bill Plotkin, Joanna Macy, and more! Twin Eagles Wilderness School Update June 2018 - Save 50% on Next Week's Summer Camps! Twin Eagles Wilderness School Update June 2018 - Seeking Volunteer & Paid Adult or Teen Summer Camp Instructors! Twin Eagles Wilderness School eNewsletter May 2018 - Wilderness Skills Instructor Traingin, Summer Camps, Volunteer or Work with us! Twin Eagles Wilderness School eNewsletter April 2018 - Women's Retreat, Summer Camps, Volunteer or Work with us! Twin Eagles Wilderness School Update April 2018 - Last chance to save over $300 on our Father-Son Wilderness Program!! Twin Eagles Wilderness School Update April 2018 - Save over $300 on our Father-Son Wilderness Program!! Twin Eagles Wilderness School eNewsletter March 2018 -Girls Coming of Age, Teen Program Update, Father Son Program, Summer Camps, Volunteer or Work with us! Twin Eagles Wilderness School Update March 2018 - What are your best memories of your Dad? Twin Eagles Wilderness School Update March 2018 - We're looking for a Lead Cook! Twin Eagles Wilderness School eNewsletter Febraury 2018 - New Girls Program, Spring & Summer Offerings, Volunteer or Work with us! Twin Eagles Wilderness School Update February 2018 - Reminder - Last Chance to Vote! Twin Eagles Wilderness School Update February 2018 - Reminder - Support Twin Eagles, Hear Tim's Message! Twin Eagles Wilderness School Update January 2018 - Vote for Twin Eagles Wilderness School! Twin Eagles Wilderness School Update January 2018 - Twin Eagles Summer Camps 2018 - Sign Up Now! Twin Eagles Wilderness School Update December 2017 - What on EARTH are your kids doing for Winter Break? Twin Eagles Wilderness School eNewsletter June 2017 - Summer Camps 2017 Update, Volunteer with Us! Twin Eagles Wilderness School Update June 2017 - We Need Volunteer & Paid Adult & Teen Summer Camp Instructors! Twin Eagles Wilderness School Update April 2017 - Last chance to save over $300 on our Father-Son Wilderness Program!! Twin Eagles Wilderness School Update April 2017 - Save over $300 on our Father-Son Wilderness Program!! Twin Eagles Wilderness School Update April 2017 - Fathers, how is your relationship with your son? Twin Eagles Wilderness School Update March 2017 - Help us find a new Sandpoint Summer Day Camp Location! Twin Eagles Wilderness School Update February 2017 - Make Your Own Wooden Bow!! Twin Eagles Wilderness School Update February 2017 - Twin Eagles Summer Camps 2017 are open for registration! Twin Eagles Wilderness School Update December 2016 - We've got the remedy for cabin fever! Twin Eagles Wilderness School Update June 2016 - We Need Volunteer and Paid Adult and Teen Instructors for our Summer Camps! Twin Eagles Wilderness School Update February 2016 - Twin Eagles Summer Camps 2016 are here!!! Twin Eagles Wilderness School Update January 2016 - Save $100 & New Dates on Bow Making Workshop! Twin Eagles Wilderness School Update December 2015 - Today is #GivingTuesday! Twin Eagles Wilderness School Update September 2015 - What if what you are seeking is right in front of you? Twin Eagles Deep Nature Connection Weekend Series for Adults 2015-2016! Twin Eagles Wilderness School Update September 2015 - How much do you give to yourself? Really? Twin Eagles Deep Nature Connection Weekend Series for Adults 2015-2016! Twin Eagles Wilderness School Update September 2015 - Is your child connected to nature? Twin Eagles Youth Programs 2015-2016! Twin Eagles Wilderness School Update August 2015 - Twin Eagles is Celebrating 10 Years! - Free Community Event!! Twin Eagles Wilderness School Update June 2015 - Twin Eagles is Hiring! Twin Eagles Wilderness School Update June 2015 - Seeking Paid and Volunteer Instructors for our Summer Camps! Twin Eagles Wilderness School Update May 2015 - Save 60% on our Father-Son Wilderness Program!! Twin Eagles Wilderness School Update April 2015 - Fathers, how is your relationship with your son? Twin Eagles Wilderness School Update March 2015 - Registration is Now Open for Twin Eagles Spring & Summer Camps!! Twin Eagles Wilderness School Update February 2015 - Announcing Twin Eagles Summer Camps 2015!! Twin Eagles Wilderness School Update December 2014 - Last chance to give a gift in 2014! Twin Eagles Wilderness School Update December 2014 - I will make the world a better place by teaching through nature! Twin Eagles Wilderness School Update December 2014 - Give the Gift of Nature Connection this Holiday Season! Twin Eagles Wilderness School Update July 2014 - Twin Eagles is Hiring a Lead Instructor! Twin Eagles Wilderness School Update July 2014 - Spread the Word, Earn Cash!! Twin Eagles Wilderness School eNewsletter June 2014 - Feature Article: Outdoor Kids Games, Wilderness Immersion Program, Summer Camps 2014, Twin Eagles is Hiring! Twin Eagles Wilderness School eNewsletter May 2014 - Feature Article: Powerful Poison Ivy Treatment, Wilderness Immersion Program, Summer Camps 2014, We're Hiring! Twin Eagles Wilderness School Update May 2014 - Lead Cook Search! Twin Eagles Wilderness School Update April 2014 - Twin Eagles is Hiring! Twin Eagles Wilderness School Update February 2014 - Twin Eagles Summer Camps 2014 are here!! Twin Eagles Wilderness School Update September 2013 - Do you yearn for holistic nature based community? Twin Eagles Wilderness School Update September 2013 - Outdoor Survival Training: Are you prepared? Twin Eagles Wilderness School Update September 2013 - Youth Programs now Enrolling! Twin Eagles Wilderness School Update May 2012 - Awakening to the Art of Mentoring - a free conference call with Jon Young, Jeannine Tidwell, and Mark Morey. Thursday June 7 @ 12 noon PT / 3pm ET. Twin Eagles Wilderness School Update April 2012 - Summer Camp Roles: Lead & Assistant Cook Needed (paid), Hiring Lead Instructors, Volunteer Assistant Instructor Positions Available, Mentor in Training Program Now Enrolling, and Summer Camps Still Enrolling. 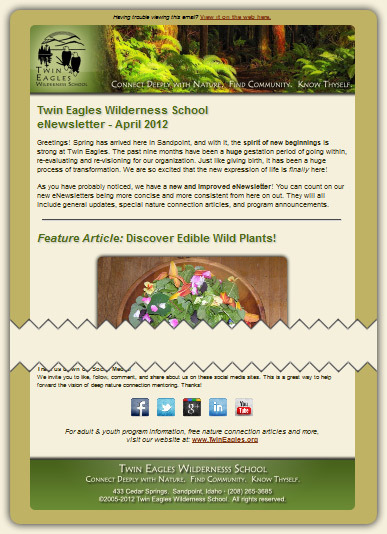 Twin Eagles Wilderness School eNewsletter April 2012 - New eNewsletter, new Website, Feature Article: Discover Edible Wild Plants, Summer Camps 2012, and Twin Eagles Wilderness Immersion Program.